suitable for all cross-country, ski touring and telemark disciplines. 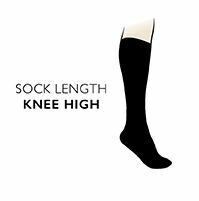 Thorlos Lightweight Ski Socks are designed with a flat knit instep and arch that improves both fit and ventilation, along with the company’s own Thor-Wick Warm fibres, allowing warmth, fast wicking and breathability. Unique padding at the ball and heel of the foot gives shear protection, and cushioned shins stop shin bite. Low profile toe seams prevent feet against the rubbing and irritation that could otherwise ruin your activity.